Thus balancing effort and effortlessness, Daoist call this "doing without doing" (wei wu wei). ​the Eastern and Western techniques that Laura incorporates in her practice. Working within a meditative state, skillfully stimulating the imbalanced meridians (nadis), to restore and balance the body's energy flow. The blood and lymph circulation is invigorated though out the body, creating a massage that is simultaneously vibrant and relaxing, generative of harmonious energy flow. The endocrine system is activated, releasing hormones and endorphins and boosting the immune system. Allowing the body to open, relax and heal itself. ​This is a biodynamic practice that draws on the Eastern bodywork technique of Zen Shiatsu and Japanese yoga. In this practice we use self-massage on pressure point during asana, stretching and toning the meridians, also called nadis by ancient Yogis. Our bodies are in constant flux between balance and imbalance. This practice will enhance the flow of lymphatic fluid, balance and stimulate immune, endocrine and nervous systems. Deep relaxation. 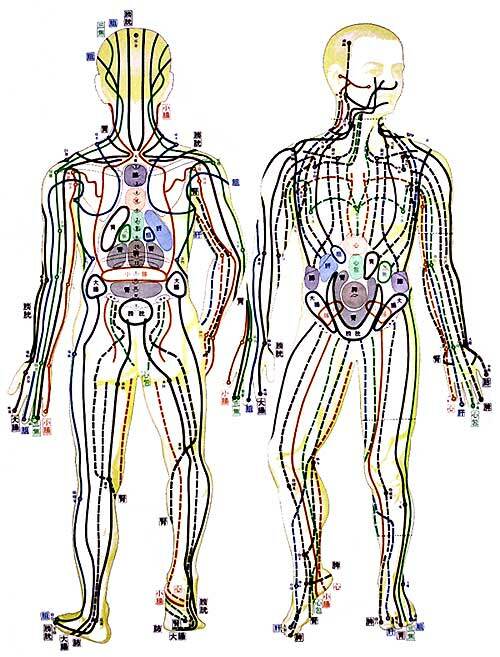 The Meridians Of Masunaga's Zen Shiatsu. The professional Zen Shiatsu therapist is trained to feel the body's condition, particularly the circulation, by his/her hands in order to find the imbalanced areas in the body. By skillfully stimulating the imbalanced meridians, the therapist attempts to restore the balanced flow. From the Western point of view, shiatsu works directly to calm the autonomic nervous system, which has the effect of calming nervous distress and increasing resistance to stress. By helping with blood and lymph circulation in the body, shiatsu helps to maintain and improve muscle tone and healthy internal organ functions. It is believed that shiatsu can also strengthen the immune system. Regular and consistent shiatsu treatments can become an important aspect of preventive health care as well as treatment for existing symptoms. by Subhuti Dharmananda, Ph.D.